Circe, the daughter of the Sun, one of the Titans, is a beautiful seductress similar to Calypso. The Odyssey was most likely composed in the 8th century BCE about the Heroic age of the 2nd millennium BCE, meaning Homer wrote about events that were 500 years before his time. He based his tale on oral traditions – the myths, folk tales and legends – that were circulating at the time. 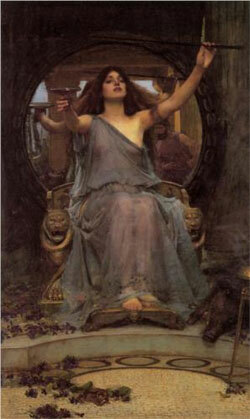 Circe, the daughter of the Sun, one of the Titans, is a beautiful seductress similar to Calypso. She decides in Book 10 – in the first magical operation recorded in Greek history – that she’d like to change Odysseus and his companions into swine. To perform her magical operation, she mixes a drug into the special cheese mixture she serves Odysseus’ companions. She then touches them with her wand, though utters no chant or spell. Odysseus protects himself by using a magical herb moly. Additionally, Circe has the ability to predict the future. “When she saw us, and words of welcome had been received, she smiled at us, and seemed to give a blessing to our desires. Without delay she ordered a drink to be blended, of malted barley, honey, strong wine, and curdled milk, to which she secretly added juices, that its sweetness would hide. We took the cup offered by her sacred hand. As soon as we had drained it, thirstily, with parched lips, the dread goddess touched the top of our hair with her wand, and then (I am ashamed, but I will tell you) I began to bristle with hair, unable to speak now, giving out hoarse grunts instead of words, and to fall forward, completely facing the ground. I felt my mouth stiffening into a long snout, my neck swelling with brawn, and I made tracks on the ground, with the parts that had just now lifted the cup to my mouth. I was shut in a sty with the others in the same state (so much can magic drugs achieve!) We saw that only Eurylochus had escaped the transformation: the only one to avoid the proffered cup. If he had not refused, I would even now be one of the bristly herd, since Ulysses would not have heard of our plight from him, or come to Circe, as our avenger. 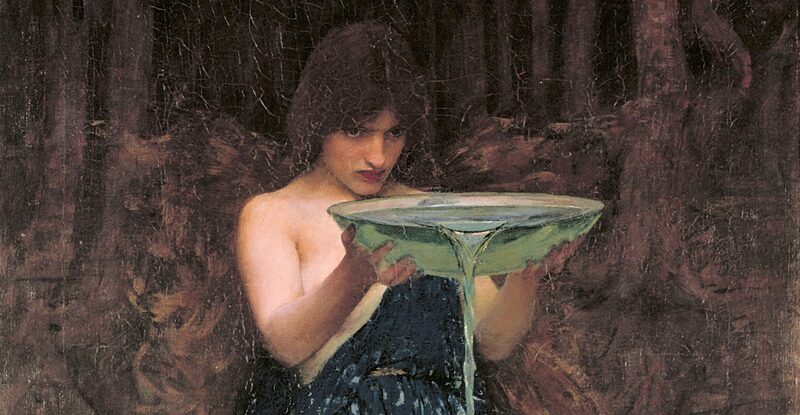 In Book 11, Odysseus performs the first necromantic ritual recorded, in the manner that Circe described. He digs a shallow ditch to serve as an access to Hades and pours milk, honey, wine, and the blood of a black ram around it. The ghosts, eager to drink the concoction, are distracted and Odysseus magically descends into Hades to talk to the dead and learn of his future. Previous Post: « What is a Sorcerer?